While being in my home town of Ottawa, Ontario /Gatineau, Québec, there were many people and artist friends to visit. This year I had the opportunity to have a fantastic dinner with artist Adrian Göllner and his wife Joanna Swim, an artist and career Art Educator. We recounted many stories of our previous years and what we have been up to. © 2018 Louise Levergneux. Birds were of interest for me this summer. 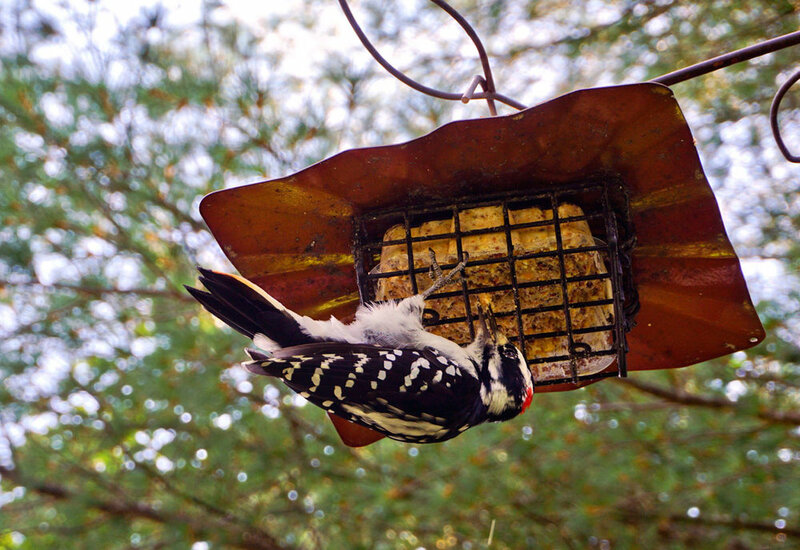 A Woodpecker visiting at my brother Denis’ cottage in Notre-Dame-du-Laus, Québec. Adrian has exhibited extensively since 1987 and has received a number of public art commissions. His studio practice concerns the transposition of sound, time and motion into other forms. 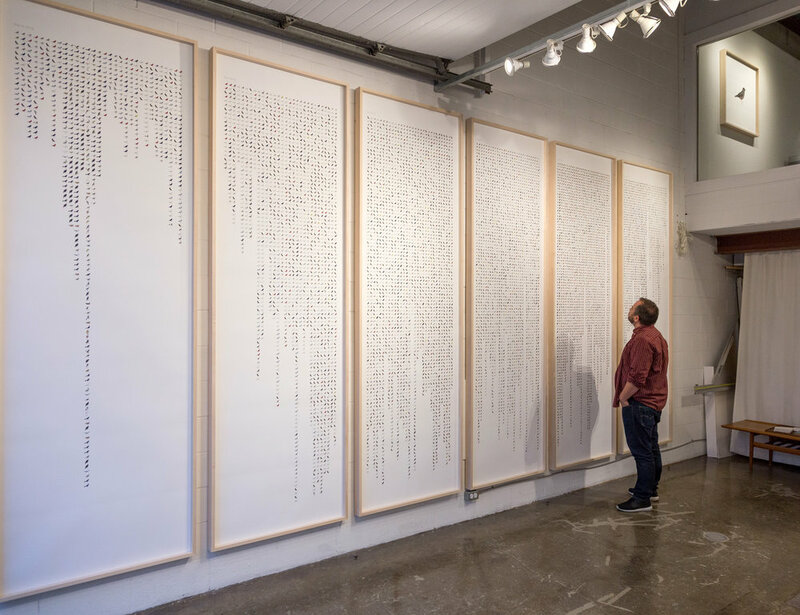 In 2017, Adrian set himself against famed ornithologist’s John James Audubon’s declaration that he observed 10,000 birds a day for his new project All the Birds I Saw Last Year being exhibited at Central Art Garage through November 02, 2018. Göllner’s daily avian observations are exhibited as large illustrated lists from which the viewer can distinguish the increasing dominance of invasive bird species. All the Birds I Saw Last Year as described by Adrian. I have become distracted by birds. Early in 2017 I began to take note of the local flocks of starlings, sparrows and crows. Depending on the weather and time of year, their location and activity varied considerably. It occurred to me that if I were to make a record of every bird I saw for a year, some larger patterns might emerge that speak to our relationship with nature. Indeed, conceiving of the local bird population as a collective canary-in-the-coalmine, I thought I might begin to detect how human activity is adversely affecting our shared environment. As I began my bird count on September 18, 2017, I was conscious of famed ornithologist John James Audubon’s (1785-1851) declaration that he saw 10,000 birds a day. How long might it take me to reach that number in an urban environment some 200 years later? Properly, each bird image denotes one sighting, so can represent either a single bird or a flock. Still, I estimate it took 240 days to meet Audubon’s one-day total. Admittedly, my pursuit is pseudo-scientific. While the regimented manner in which the results are presented suggests a scientific eye, what birds I see from day to day is largely random. Perhaps the project is best expressed as the meandering of one being intersecting with the meanderings of many others. Be that as it may, over the course of several months, the fluxes in the local bird populations are apparent and patterns can be discerned. One observation that is particularly telling is that 38% of our local bird population are invasive birds, species that humans naively introduced and which now thrive in the urban environment, displacing endemic birds. During the course of the year, I realized the project pitted my Neolithic brain against my modern sensibilities. While I am now able to rapidly identify birds by their colour, call, behaviour and flight pattern – something our ancestors would have relied on to find food or be warned of approaching predators – I am compelled to categorize and order those birds in the same all-too-modern manner that has, ultimately, led to the exploitation of the natural world. That all my bird sightings are recorded on my mobile phone, something that keeps us disengaged from our physical surroundings, belies a whole other set of ironies. My desire is for the project to be read as a gesture of hyper-attunement at a time in which we are all increasingly aware of the rapid pace of environmental change. I am at once buoyed by the intelligence, ingenuity and incredible beauty of our avian neighbours and distressed by how we humans impinge on their lives on a daily basis. As soon as Adrian described All the Birds I Saw Last Year, I was hooked by the idea of how a collection can be amassed and the way it’s transformed from concept to practical reality. Have any of you worked on developing collections?